Well, how's that for a blog post title? In truth, there isn't much to report this week. We're adjusting to hubby's new work schedule and finding time to do much of anything besides kid-chasin' has been a real struggle. I'm confident that we'll get settled shortly though. Some days are just like this. In the meantime the kidlets and I have been tending to our new chicks, gathering from the woods, and doing some cooking together. This week we sugared violets for our banana muffins, made some cheese, sweet potato gnocchi, and tonight we're making parsnip muffins. It will be the very first time any of us have had parsnips so this should be interesting. In studio news, my little shop is in the IndieFixx Spring Galleria. If you're looking for some new indie shops to discover, you should check it out. There are some really amazing finds and "new to me" shops. IndieFixx is a lifestyle blog and more, and is a wonderful source of information and inspiration. In the woods, we're seeing much more green. Today is day two of rain and it's amazing just how quickly everything greens up. The ferns are coming up, the trilliums are unfurling, and the acorns are starting to sprout. We're enjoying this period of beautiful bug-free weather immensely. I hope you had a good week. Enjoy your weekend! I received an amazing, AMAZING, bit of mail love yesterday and just had to share it. My friend Lynn, ( silverwork on Etsy) is a very talented metalsmith and I had asked her if it would be possible to make me a brooch out of a tiny fish fossil that I had (from MWNaturesAntiquities also on Etsy). I didn't know what was possible with the soft limestone, but Lynn said she'd give it a whack. What I received is pure art, and I was gobsmacked when I opened the box. There was my fish, surrounded in copper (love!) and finished with feathers. Fish, chicken feathers, and copper? Yes please! Around the outside she had stamped "On the fifth day he made the fish and fowl". I love that she included the sketch of her idea too. I honestly can't decide whether to wear this or hang it on my wall as art. Perhaps both. Lynn has a photo of the brooch on her blog, too, which I didn't see until after I received it so I was completely surprised. Yay! Yesterday was Earth Day, and ma nature was kind enough to give us some beauuuuutiful weather to enjoy. The buds are opening on the flowering plums we brought in from the woods, and plant life is starting to come to life everywhere. We dug up a clump of chives (which the boys call "hot grass") that had been growing in the hard-packed clay/sand mixture that is my yard,and planted it in our crock. I plan to keep this outside my kitchen door, knowing that if they're nice and close I'll use them in cooking more often. I've been making garden markers from birch and twigs, and added one to the pot. We also checked on our hen and chicks, which has spread considerably. Lots of little babies all over. It always amazes me that it can survive our Minnesota winters and thrive. We watched our actual hens and chicks for a while too. We were busy little bees. I also had a little time yesterday to put some new brooches in the shop. I've been cutting birch discs for my birch ring brooches, and used the inner wood piece on these new brooches. I've applied a thin layer of birch bark to them and drilled holes, mimicking the woodpecker holes I've been admiring lately. I hope you all had a wonderful day yesterday and are looking forward to a wonderful weekend. Enjoy! Thank you to my awesome customers who helped me raise $45. for the Earth Day Network yesterday! Hooray!! "Earth Day Network was founded on the premise that all people, regardless of race, gender, income, or geography, have a moral right to a healthy, sustainable environment. Our mission is to broaden and diversify the environmental movement worldwide, and to mobilize it as the most effective vehicle for promoting a healthy, sustainable environment. We pursue our mission through a combination of education, public policy, and activism campaigns." Acorns symbolize patience, potential, and strength which seems fitting on this day of activism. The acorns are made of wool, which is a sustainable material, real caps picked from the forest floor, and a hemp ribbon so it can be tied as an ornament or even worn around the neck. The kidlets and I will be doing some repurposing projects today and will share our goings-on with you tomorrow. 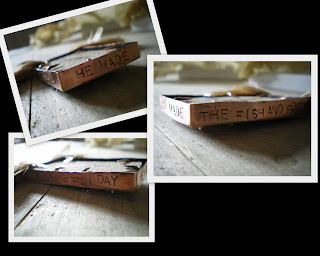 If you haven't already, you may want to check out the EcoEtsy Earth Day Auction. Score yourselves some beautiful handmade and eco-friendly goodies while helping us raise money for environmental charities. I hope you all get a chance to do one small thing today, whether that be tossing an errant bottle in the recycle bin instead of leaving it at the curb, choosing to buy local produce, or bringing your own reusable bag to the store. Big or small, I'd love to hear what you did, so please share. Well, I had hoped to be ultra-productive this week and finish up enough mushroom sculptures to proclaim an all-out Mushroom Mania!! in my shop this week, but that's not gonna happen. I did taxes (blech), recovered from the depression resulting from taxes, dreamt of Maine, and France, and the Doo Nanny, and of friends. Gathered birch bark, got lost in making plans for the birch bark....you know how that goes? I did finish one tiny twosome, and I'm almost done with another piece that's already spoken for, but I'm afraid that will be it for this week. We've been invited to dinner tonight so this week is kind of a wash. I hope to be back in the groove next week. I have so many ideas that I feel like I'm going to bust. I actually pulled out the sketchbook, something I rarely do, just so I don't forget all of these ideas rattling around in my head. I hope you're having a more productive week, or at least enjoying a non-productive week, if that's the case. I'm having a little laugh at myself this morning and thought I'd invite you to join in the fun. I was playing with my birch ring brooch concept, and wanted to have a birch ring within a birch ring. I was going along, la di dah, when I looked down and saw a big wooly eye staring at me instead of the fabulous brooch I had envisioned. AN EYE. Wait! If I turn it the other way, it sort of looks like a papoose. Or an eye at an angle. Not quite what I was going for. Maybe if I avoid using eye colors on the next one....or maybe they're all going to look like eyes to me... I don't know. Maybe I should make two of them and wear them on the back of my hat so my kids really think I have eyes on the back of my head. Anyway, it was a concept I had to try. On another note, after an initial unsuccessful attempt at cheese-making, I am proud to say that I made a ball of, what is quite possibly, the tastiest mozzarella cheese in all of Minnesota last night. Using my handy-dandy kit from UrbanCheesecraft, and a gallon of non-homegenized, Minnesota-grown, organic whole milk from Cedar Summit Farm that I purchased at our tiny little local food co-op (which just moved to a more convenient location, I'll add) this weekend. Success! My first try involved a Wal-Mart brand milk and I suspect it is ultra-pasteurized which extends shelf-life but doesn't do much for cheese-making. I paired the cheese with some toasted french bread, a sun-dried tomato spread I made ( minced sun-drieds, olive oil, and balsamic vinegar - yum!) and some diced tomatoes and garlic. Oh so tasty. If you've been on the fence about trying cheese-making, you should really try it. The mozzarella came together so quickly and easily that I can't believe I didn't try it sooner. Sorry, there are no pictures of the cheese, it was devoured before I could capture it. Have a happy Tuesday, everyone. I find a fair number of metal uniform buttons in my collection. These are not of the military variety, but rather buttons from the working man. Maybe they held up pants, or closed a jumpsuit. Most are nothing fancy, most have chipped paint and very little ornamentation, and compared to some of the pretty buttons they're pretty plain. Most of the uniforms have no discernable marking, but this one marked Dutchess Po'Keepsie intrigued me. I tried finding information but kept coming up short until a very sweet Twitter friend pointed me in the direction of this blog post. 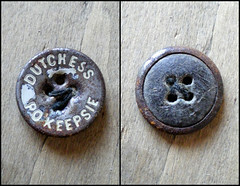 It would seem that this plain little button could have been on a pair of Dutchess trousers from the late 1800s. A suspender button perhaps? From the blog: "They also had a warranty of sorts and for the first two months that you wore your ”dutchess trousers” they offered to pay 10¢ for every suspender button that came off, 50¢ if they ripped in the waistband, and $1 if they ripped in the seat or you would get a new pair of trousers free." You don't see that kind of guarantee much anymore, do you? I have a few other marked uniform buttons that I'd like to identify, just to satisfy my curiosity. If I get lucky and find information, I'll share them here. I like to choose these chippy buttons for using as eyes on my bird ornaments. I wonder sometimes if people think I'm nuts for using these chippy little things instead of some pretty shiny number, but that's just kind of how I roll. When I was out walking last weekend I noticed several downed trees in our woods. It had been really windy and we lost a few, which is often the case. We have a lot of Poplars (or Popples as we call them) in our woods which are notorious for falling down in high winds, but one of the trees that fell was a Birch . While I was a little sad that it fell, there was little question that it would be put to good use. I set out today with my little gatherers to harvest some bark from the tree. The smaller limbs will be hauled back and cut for buttons and brooches, and the leftover wood will be put in our pile for firewood. The bark however is destined for other purposes. Random fact- did you know that birch bark is an excellent firestarter? It will catch a flame even when wet. I've chosen a branch from which to cut my bark piece. I'm using a carpet cutter set shallow, less than .25", and am making a circular cut around the branch. I make another parallel cut a few inches away from the first cut. The distance between the two cuts will dictate how tall the resulting bark "tube" is. Sometimes small branches or knots dictate this for you. I then cut a line connecting the first two cuts. And there you go! Bark tube, ready for crafting. I still have a lot of de-barking to do, but for now I have enough bark to keep me busy for a bit. Expect to see some birch bark items in the shop soon.